Christian HS Head Coach Matt Oliver has been with the Patriots since 1999 and is fired up to have the opportunity to play in the 2017 Honor Bowl. The Patriots will have returning QB Brad Jeremiah at the helm who compiled 2014 YDs with 21 TDs and only 6 INTs. The 2016 12-1 record is an indication of the dedication to believe in the coaching staff that strives to play with heart and soul on and off the field. Boron High School is in the small desert community of Boron and is coached by Robert Kostopoulos. The Bobcats have recently been added to the Honor Bowl and are excited to be able to soak up the activities of the event as well as matchup against a great team that Christian HS will field in 2017. 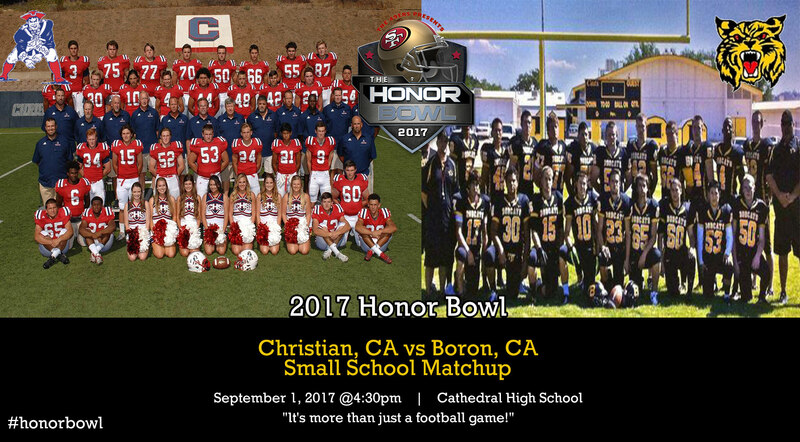 Boron typically fields a small roster but this first gamer of the 2017 Honor Bowl will definitely be a fun one to watch!